It’s been a big week for PetSafe® Brand and the pet industry! Manufacturers, retail partners and media gathered in Orlando for the 2017 Global Pet Expo to show off the latest and greatest products to enhance the lives of all kinds of pets. For some perspective, imagine 13 football fields put together. Now fill it with the newest and most innovative pet products for dogs, cats, fish, birds, reptiles, small animals and even horses. PetSafe Brand is right in the middle of it all, showcasing 18 new products to the world. Here are a few of the pet product solutions we’re introducing this week. 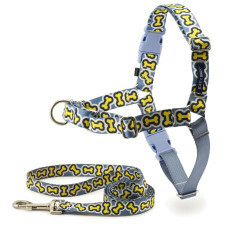 The PetSafe® Easy Walk® Harness Chic features a comfortable fit and bright new patterns. This easily adjustable harness allows pets to look stylish while out with their owners. Its design stops leash pulling quickly and safely. 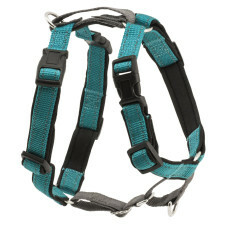 The Easy Walk Harness comes with a matching 4 ft. leash and is available in three colors and four sizes. 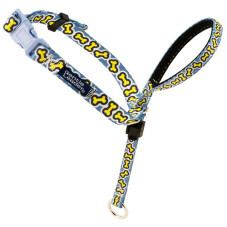 The comfortable PetSafe® Gentle Leader® Headcollar Chic is fun, stylish and fully adjustable. The padded nose loop allows for extra comfort, and the adjustable neckline provides an optimal fit. The Gentle Leader Headcollar includes an instruction guide, training DVD and a matching 4 ft. leash. It is available in three patterns and three sizes. The no-pull PetSafe® 3in1 Harness is 3 harnesses in 1! The design includes a front leash attachment for no-pull walks, a back leash attachment for more comfortable runs and a car safety restraint for safer trips. The 3in1 Harness comes in three colors and four sizes. The PetSafe® SMART DOG Trainer® allows pet parents to train their dog using a smartphone. 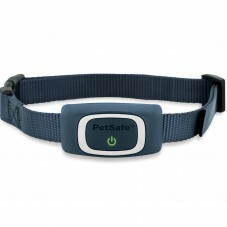 Utilizing Bluetooth wireless technology, the PetSafe SMART DOG Trainer app connects an iPhone® or Android™ smartphone to the training collar, providing an easy, convenient way for pet parents to communicate with their pet. The PetSafe® Free to Roam Wireless Fence™ keeps pets contained within a circular area of up to half an acre or 180 ft. in diameter. There are no cables to bury or trenches to dig – simply plug the transmitter into a standard outlet to activate the fence. It comes with step-by-step installation and training instructions and can be easily set up in 1-2 hours. For homes with multiple pets, PetSafe Brand also offers additional Free to Roam Wireless Fence™ Receiver Collars. The PetSafe® Digital Two-Meal Feeder keeps food fresh while preventing curious pets from breaking in. Its easy-to-read LCD display allows pet parents to accurately schedule two meals with the digital timer. Each removable, dishwasher-safe tray holds up to 1.5 cups of dry food. The PetSafe® Sportsmen Squeak ‘n Treat Toys come in a bright orange color for outdoor visibility and multiple shapes. The toys can hold various dry and semi-moist treats, kibble and peanut butter. The challenging shapes and unique combinations, like treating and squeaking, keep dogs busily entertained. The PetSafe® Sportsmen Ring Holding Toys come in a bright orange color and five different shapes—all durable and designed to hold refillable treat rings for longer lasting playtime. The Ultra Stratos toy uses ultra-thick rawhide rings for aggressive chewers, and the remaining four toys use the traditional sized rings. Each toy includes four treat rings. The PetSafe® Sportsmen Tug-A-Jug™ and Sportsmen Kibble Nibble™ meal-dispensing toys are blaze orange and come in two sizes, both designed to hold enough kibble to feed a dog an entire meal. Knowing that eating quickly can be dangerous for dogs, these meal-dispensing toys slow meals down and challenge dogs by combining a meal with a rewarding puzzle. The PetSafe® Busy Buddy® line now includes Calming Toys with a soothing chamomile scent to help reduce anxiety in pets. The treat-dispensing chew toys also include training and behavior advice from professional dog trainers. Two sizes are available. The PetSafe® Busy Buddy® Ring Holding Animals are designed to hold ring-shaped treats. The rubber toys are made of durable nylon and are scented with natural vanilla. The toy and treat combination provides a playful and rewarding challenge for dogs, which helps keep them engaged for long periods of time. The Ring Holding Animals are available in two sizes and come in hedgehog, unicorn, dinosaur or turtle shapes. PetSafe® Busy Buddy® Value Pack Treat Rings are irresistible treat refills for the ring holding animal toys. The variety pack includes 12 natural rawhide rings and 12 peanut butter flavored rings. The combination of toys and treats makes for a longer lasting and more enjoyable playtime. Three sizes are available.